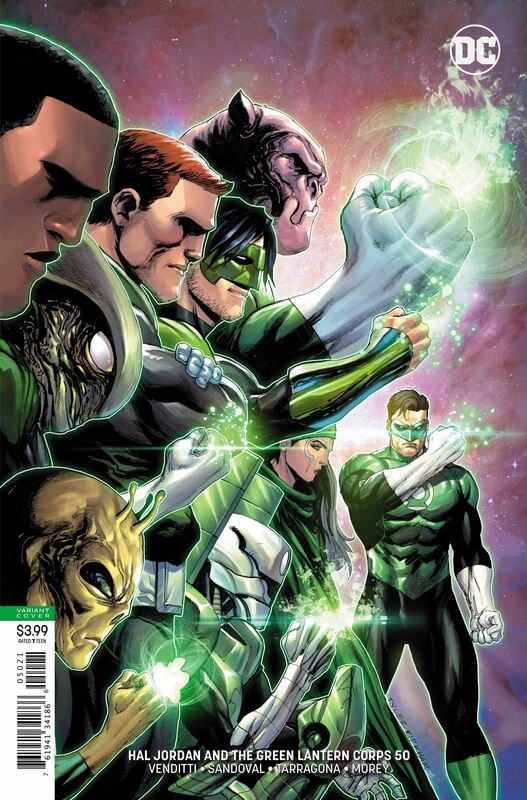 Hal Jordan and the Green Lantern Corps #50 review – AiPT! Can murder ever be “just”? The rise of the Darkstars ends in this climactic issue 50! The galaxy rests a little easy as the Green Lanterns restore law and order from the lethal justice of the DarkStars. The green burns bright with hope and will for all in the universe. This issue explores the issue of just murder. One definition of the phrase is the justifiable killing of someone, such as a person who commits a crime. The Darkstars engage in just murder for criminals, while the Lanterns don’t. The Green Lanterns do not kill and place the criminals in cells for a set period. Both have their merits and shortcomings depending on where one stands on the issue of justice. John Stewart chose to set an example to the universe in the battle against the Darkstars by ordering the Lanterns not to kill. The order sets the Lanterns apart from the Darkstars. The question remains: who is right? Some of the criminals in the universe committed genocide and other grave actions. Should they face the same fate as those they killed? Or should these criminals pay for their crimes in a cell, live with their action(s) and guilt, and be given a second chance? One could argue that killing will result in more killing, creating an endless cycle of violence. Yet, that is the world that Green Lanterns live in. The Lanterns play the role of changing that behavior and mentality. They did so with Hector Hammond, some members of the Sinestro Corps, and others. All former adversaries and criminals in their own right, the Greens worked with them to turn a new leaf together. This issue places the Lanterns in a moral high ground against the Darkstars and holding strong to a better way to justice for all. After all, it requires a lot of willpower to be the bigger person. Having defeated the Darkstars, the Greens look to the future. New recruits are on their way and a young Xudarian takes the green ring. The universe is stable and at peace…until a new threat arrives and the Green Lantern Corps will be ready. Robert Venditti gives us a hopeful end to his run on the series.